The anoles are small to medium-sized (7 inches maximum), mainly arboreal lizards that have become immensely successful. More than 300 species range from the southeastern United States through the humid tropics into Brazil. 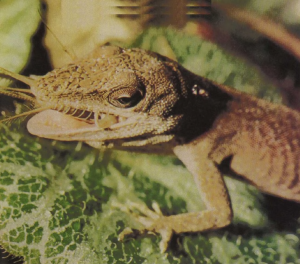 Once this anole was the only United States species, but some half-dozen other Latin American forms have recently been introduced into southern Florida. Intensive study of these common and easily observed animals is teaching herpetologists a great deal about the way in which reptiles invade new areas and how new species arise.